You’ve never seen the Dells like this! 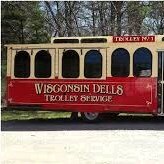 An open air trolley ride (weather permitting) delivers the sights and sounds that made the Dells famous. Hint: it wasn’t the waterparks. Kick off autumn in style! A buffet lunch at Trappers Turn rounds out this tour. TOUR INCLUSIONS: Professional tour director, transportation, trolley tour, and lunch.